The independent bookstore is closing. EAST VILLAGE — Legendary St. Mark's Bookshop is closing its doors Sunday after almost 40 years in business, the store announced Wednesday on its social media accounts. Our last day open will be Sunday, February 28, 2016. Thank you for your many years of patronage. The store, located at 136 E. Third Street had been financially struggling for months, and was drowning in debt, its co-owner recently told DNAinfo New York. Bob Contant, St. Mark’s Bookshop co-owner, said the shop owed $68,000 in back rent to the New York City Housing Authority as well as $34,400 in unpaid taxes, according to reports. 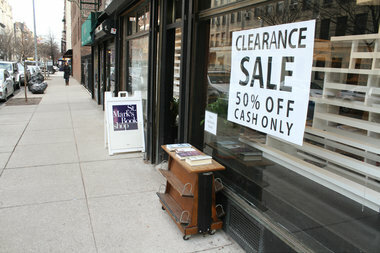 “We’re selling everything off,” Contant told DNAinfo last week. “Once we’ve reached the point where I can’t pay my staff, that will be it." The store, which sells books covering a wide range of topics from cultural theory to graphic design and small press publishing, is organizing a clearance sale until Sunday, with everything priced at 50 percent off, cash only. Patrons mourned the closing of the store on social media, calling it a loss for the city. "You were a symbol of the East Village of the 80s and 90s. A major landmark. Thank you for supporting all of us. Heartbreaking," Catherine Texier wrote on the store's Facebook page. "So very sad. You have been an essential part of the fabric of the EV and NYC for so long. We are losing our beloved city piece by piece," Johanna Climenko commented. The bookstore will be open from 11 a.m. until 11 p.m. through Saturday, and from noon until 10 p.m. on Sunday, Feb. 28. For more information, click here.